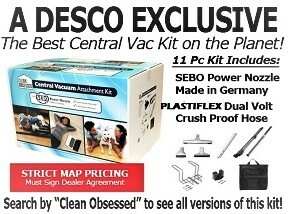 Desco Vacuum Supply is committed to ensuring that your privacy is protected. Should we ask you to provide certain information by which you can be identified when using this website, then you can be assured that it will only be used in accordance with this privacy statement. Desco Vacuum Supply may change this policy from time to time by updating this page. You should check this page from time to time to ensure that you are happy with any changes. This policy is effective from August 1, 2012. We are committed to ensuring that your information is secure. In order to prevent unauthorised access or disclosure we have put in place suitable physical, electronic and managerial procedures to safeguard and secure the information we collect online. However, Desco Vacuum Supply cannot be held liable for any security breach. Cookies are also used for website logins and interactions between the customer and the website's database. If you have previously agreed to us using your personal information for direct marketing purposes, you may change your mind at any time by calling or email us. © Desco Vacuum Supply. All Rights Reserved.